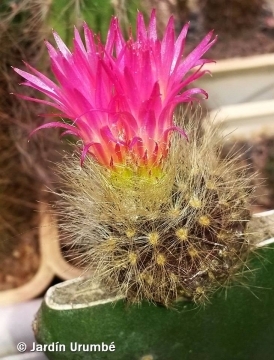 = Neoporteria villosa var. laniceps (F.Ritter) A.E.Hoffm. Cact. Fl. Silvestre Chile 172. 1989 A.E.Hoffm. Origin and Habitat: Carrizal Bajo, 03 Atacama, Chile. Habitat and ecology: This species occurs in coastal hills (lomas costeras) on rocky soils. The coastal formations in this region have vegetation corresponding to the Desierto Costero Huasco (Huasco coastal desert). Due to occasional precipitation, this vegetation has more permanence and continuity than the vegetation occurring farther north. 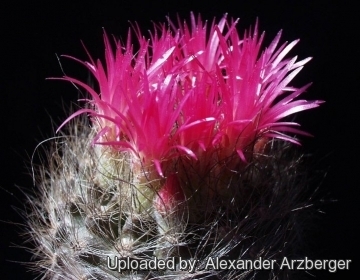 The endemics include Copiapoa echinoides, Copiapoa malletiana, and Neoporteria carrizalensis. At times this region is dominated by geophytes, which can cover expanses of the desert spectacularly. Description: Neoporteria laniceps, also known as Neoporteria planiceps, is a small plant with a brownish-green body; this is surrounded by long thin straw-coloured to brown spines which are twisted and interwoven, producing a bird's nest effect. The freely-produced tubular deep pink flowers are not very large and have inner petals which remain upright around the style. 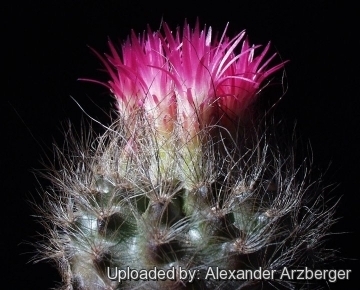 Neoporteria laniceps is generally included within (as a synonym of) Eriosyce villosa, suggesting that there is not really a fundamental difference between the two. Stems: In shadow green, tanned in the sun, 3-4 cm thick, up to 20 cm tall, depressed and woolly at apex. Root: Large tuberose yellowish constricted at neck. Rib: In juvenile plants the ribs are fully dissolved in tubercles, while mature specimens form 13-17 deeply notched, slightly spiralling ribs. The notches have a strong rounded chin just below the areole and are flattened on the sides, in young plants they are ca 3 mm long, in old plants they are up to 8 mm long and wide, and not noticeably broadened at the base. Areoles. Sunk into the flat exterior surface of the notches, 2-4 mm long, about 2 mm wide, with white hairs, 2-5 mm apart. Spines: Strong or fine hair-like, straw-coloured to brown, more or less curved or frizzy. Radial and central spines almost indistinguishable, but centrals often brown to black, rough, 2-4 cm long, and radials a little shorter and lighter or grey, or of the same colour, about 20-40 per areole, tuft-like and spreading. Often in older plants the radial spines are all transformed in delicate protruding tufts of wool. Flowers: Borne at plant apex on young areoles, up to 28 mm long, and 2 cm in diameter when widely open. Ovary, green, globular, 4.5 mm in diameter, with very little red scales and dense white woolly flakes. Nectar-chamber 2 mm high. Tube narrow, funnel shaped, 10 mm long, 5 mm wide at the top, outside reddish, with a few pointed red scales, white woolly flakes and some yellow hairy curled bristles. Inner perianth segments deep pink, held upright around the style, outer perianth segments spreading outward, and curved back, all about 12 mm long, and 2 mm wide, and pointed at apex. Stamens, white, erect, all about the same length; pollen pale yellow. Pistil white, ca. 21 mm long with about 7 pale yellow stigma lobes. 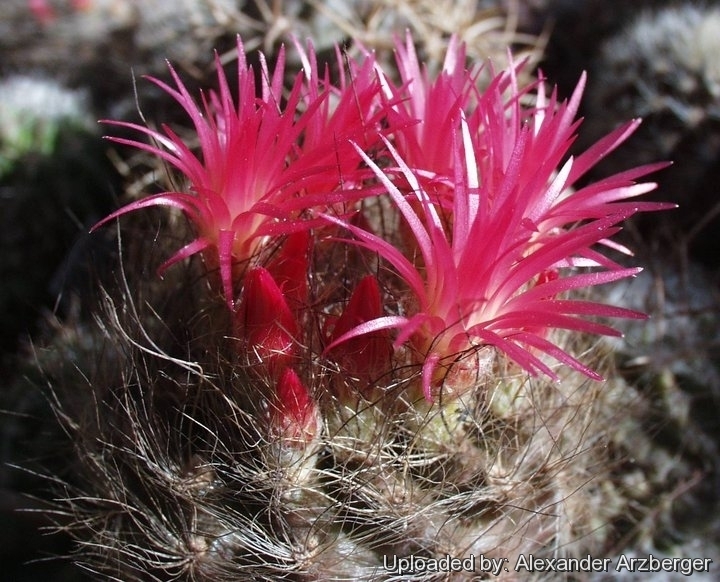 Blooming season: In habitat Neoporteria laniceps is a winter flowering plant. Summer is warm and arid, and the winter is cool but frost free. On the contrary in Europe this plants are usually kept dry in winter and moist in summer and flowering appears copiously in late summer. Flowers remain open for several days, both at day and night. Fruits: Carmine red, about 12 mm long, 7 mm thick, barrel-shaped, very constricted at base, covered with very little red scales and dense white woolly flakes, with some white hairy curly bristles in the upper end, and retaining shrivelled floral remnants at apex. The fruits split open at maturity by a circular bottom hole. Seeds: 1 mm long, 0.7 mm wide, 0.5 mm thick, strongly arched in the back. Testa matt black, with extremely fine flat tubercles; hilum sub-basal, white, roundish.